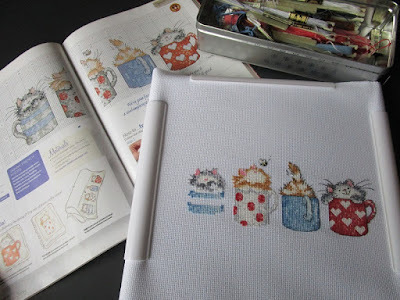 - Tangled Threads -: Cats and cake! I've managed to get a bit more of them done, although not as much as I would have liked but it's all my fault! 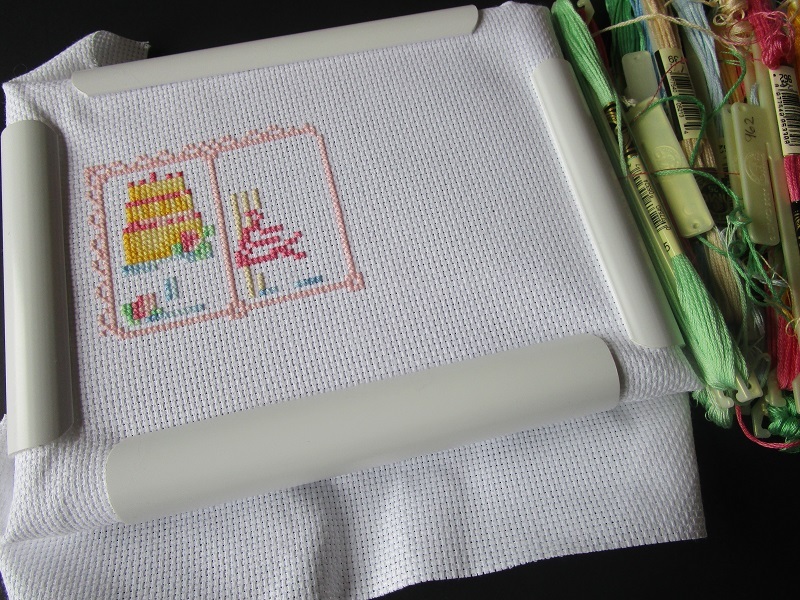 I normally watch tv while I stitch and tend to 'listen' to a film or show.....I'm sure many of you do the same thing. But at the moment I have been watching the ice hockey and you really can't just listen to that on the tv.....it's something you have to watch....especially when your team is in the finals :) So my stitching has been confined to the short breaks between periods. So here's to more cats and cake....and ice hockey! 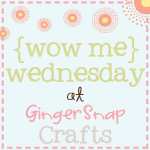 Until next time .....happy stitching! Two great projects. Beautiful progress. Your MS stitching is so cute :) How to you hold the large Qsnap frame in hand while stitching ? 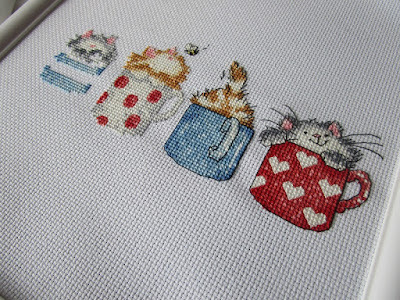 Lovely stitching , so cute . Both the kitties and cakes are cute. What a difference the back-stitching makes, the grey kitties face and whiskers are so cute! I have seen the cakes SAL on FB, and some of the stitchers have added beads and sparkly threads to their cakes, it's fun to see the differences. Love MS's designs! They are always so cute. Great stitching on the SAL too. Those kitties are too adorable, and you are right, the back stitching is really bringing them to life. I can't wait to see it finished. I love those cats in cups, such fun! I liked the first two blocks of the SAL but not the tea and cake lettering so much. I like a script rather than blocky letters. It's still very pretty though. Your kitties are looking fabulous! There is something to be said for back stitching. And the cakes, so tempting! Sooooo close to having a finish!